Most countries in the world today are being changed by what we call globalization. It is a complex process which took off after the end of the Napoleonic Wars (1803–1815), not long after Australia was incorporated into the British Empire. The official, polite definition of globalization is the “international integration arising from the interchange of world views, products, ideas, and other aspects of culture.”(2) In the 19th century the visible instruments of globalization were the telegraph and the steamship. These have now been replaced by the internet and container ships. Such control is more subtle when it takes the form of trade agreements like the TPP. In this case the leaders of individual countries seem to agree voluntarily to a range of changes to their policies and laws which give special privileges to foreign investors. Another difference between the older methods of colonial control and the push for globalization is that its supporters are the people who own and control the largest multinationals and banks. The US is the prime mover pushing globalization, but it has supporters in many countries, mostly by the bankers and important business leaders in those countries. The corporations and banks even push the globalization agenda on the US itself, even though it is bad news for most citizens of the US. Since 1971,the economic policies of the international investors codified by the International Monetary Fund(IMF), called the “Washington Consensus”, has been compulsory policy for any politician in the West who hopes to enter the parliaments of our democratic system. Most of these policies will be recognized as the kinds of demands made by politicians in all Western countries today. In fact no politicians in any Western country can resist promoting these policies because the banks and the representatives of the US Empire like the IMF enforces them. 1. Cut spending on social services, pensions, “welfare”, education and health. 2. Introduce "user fees" for social services (user pays) or privatize them. 3. Demand higher taxes on ordinary people. 4. Cut government “bureaucracy” and reduce services. 5. Use private capital for the development of infrastructure like roads, airports rather than fund with tax revenue. 6. Remove trade and investment rules and deregulate financial intuitions. 7. Promote export-orientated and resource extraction industries instead of industries which primarily serve domestic markets. 8. Provide tax breaks and subsidies to export industries. 9. Remove tariffs and allow failing firms to go bankrupt. 10. Privatize national assets like electricity, water, transport, telecommunications. Most ordinary people will wonder why politicians cut funding for education and health or provide tax breaks for large corporations while increasing the tax burden on ordinary citizens. When they see that the results of privatizing water or electricity means that the service gets worse and the costs increase, they ask why this was a priority for all political parties. The answer is that foreign investors do not live in the countries they invest in. They simply don't care about what happens to the people in these countries. What these policies have in common is that if they are adopted they will increase the profitability of investments in that country. Why local politicians share this lack of interest in the consequences of these policies needs to be explained in more detail. There are many ways government can be forced to adopt these policies by the banks. If a country or state has a loan, this loan has a credit rating set by the three main agencies: Moody’s, S&P, and Fitch. Each has a somewhat different system, but loans with the highest ratings are called “prime” or ‘high grade” loans, and the loans with the lowest ratings are described as“highly speculative” or “default imminent”. However recent events have shown that these ratings agencies are actually owned by the big banks themselves, and the agencies are not immune from pressure from the US government. This means that the ratings for any loan can be based on many factors besides the financial health of the debtor. For example, before the 2008 crash these ratings agencies were giving high ratings for what turned out to be “sub-prime” investments based on home mortgages for people who were known to be unable to pay them. Such investments should have been rated as “substantial risks” but then who would buy them? In the same way, a government that did not do what investors want can have the ratings of their loans downgraded, which means that the interest the government needs to pay will increase. There is no review or appeal against these judgements, as investors take them to be gospel truth. All politicians know this. If they do what the banks don't like, their country will be penalized. This also explains why governments tend to borrow from these banks. For them, it is a safe investment. More loans means more profits for the banks. We are told the same thing about globalization by business leaders, politicians, economists and the media: The changes demanded by globalization are normal. While all public discussion of globalization insists it is the only way for the future, the process itself is driven by a small number of very powerful people known as the super-rich or the 1%. What do the 1% have to do with globalization? It is their plan for the economic development for the whole world. Their investments in different countries will be more profitable if all countries coordinate their economic development according to the plans devised by the global elite. Each country has been assessed on what it can contribute to a new system of global manufacturing and international trade. He not only admits that he has worked to create a “more integrated political and economic structure”, he is proud of it. Rockefeller himself worked tirelessly to implement the “international integration” that is overwhelming us. The history of Australia after World War II provides an excellent example of this policy. Many companies, often connected to similar companies overseas began to produce cars, televisions, refrigerators and all manner of consumer items. However beginning as early as the 1970's wealthy international investors decided they and their companies could make more money with a very different global system. What they had created after WW II was a system in which many countries had their own industries serving the local market. The super-rich came to see this system as inefficient. One larger facility was more profitable - to them - than a number of smaller ones. They also realized that wage rates in the US and other countries of the West were becoming much higher than the wages paid to workers in other countries. To implement their plans for new manufacturing centres in low wage countries, the 1% needed to get countries to lower or remove tarif barriers established to protect local industries. Each country was assessed on what it could contribute to this new system of global manufacturing and international trade. High wage countries like Australia was seen as a place to produce raw materials like coal, iron ore, natural gas and other broad-acre agricultural products like wheat, wool, and beef. Cheap labor countries like China, India, Vietnam, etc. were designated as manufacturing centres for many consumer products including food. So even though Australia produces food stuffs as a raw material, its people are expected to buy cheaper imported food made in low-wage countries. Under globalization, international investors have considered how each country can be shaped to fit into their world-wide scheme of production and exchange. Political leaders in each country then implement these plans without regard to the needs of their own local population. It is well known that Donald Trump drew much of his support from people who had been thrown out of work by “trade agreements” like North American Free Trade Agreement (NAFTA). These people opposed the planned Trans-Pacific Partnership (TPP) pushed by Obama and Clinton. Dissatisfaction over trade policies had been growing in the US, and Trump wanted to offer a different direction for US economic policy. People who oppose globalization are often accused of racism, but their critics seem to be blind to the economic realities which forces ordinary people to fight against it. The people who conceived this new world economic system realized that in order to implement their plans they would need to have all counties change both their basic economic policies and their laws. There are several ways the 1% have used to change the policies of different countries. One strategy is to use force, either in a coup or an invasion. This new system was first applied in Chile after the brutal coup by General Pinochet in September 1973. The economic “reforms” the new government introduced were based on the ideas of Milton Friedman and the Chicago School. These “reforms” included privatizing all industries nationalized by former President Allende, privatizing the social security system, and opening up assents to US investors. However controlling the world is not a simple process, and overt coups or invasions are only part of the total process.. First the 1%, foreign investors mostly from the US, UK and the EU, need to formulate their plans. This is done in universities and think tanks. Slowly, since 1971, the economic policies of the international investors codified by the IMF called the “Washington Consensus” has been compulsory policy for any politician in the West who hopes to enter the parliaments of our democratic system. All must adhere to the dictum of Margaret Thatcher: There Is No Alternative (TINA). This in effect says that no further discussion of these policies is allowed. Talking about alternatives is forbidden. In order to enact the required policy changes Wall Street needed to promote politicians who would go along with these new policies. In Western democracies this is done by funding the campaigns of people who support these policies. This explains why over the years the different political parties in the West have all adopted the same economic policies required by the global organization of all trade and manufacturing. For example, in Australia we began to hear debates between “wets” and “dries” on economic policy. The “wets” wanted to keep the tariffs and protect local producers, while the “dries” wanted to encourage “free trade” which was going to be the best for our economy. Of course this was a lie. It was really best only for the foreign investors who owned the giant corporations that were now expanding their manufacturing in low-wage countries. Now objecting to anything called “free trade” is attacked as “protectionism”, as if it is a sin to protect the jobs and the living standards of your country. The most recent political push for policy changes required by globalization was the Trans-Pacific Partnership (TPP) in the Asia-Pacific region and the Transatlantic Trade and Investment Partnership (TTIP) between the US and the EU. It comes as no surprise that Jacob Rockefeller was instrumental in pushing for global trade policies, unlike the Bilderberg group which only concentrated on policies for the US and Europe. This amazing concentration of wealth can be seen in two different ways. First, over the last 30 years the share of all income possessed by the wealthiest 1% in Anglo-Saxon countries has risen dramatically back to levels not seen since the 1920s. The financial crash of 1929, together with serious social unrest and the huge level of destruction in the West due to WW II not only impoverished millions of ordinary people. It forced governments to enact socially responsible legislation like affordable health care and defend the rights of unions to fight for higher living standards. The super-rich in the United States particularly was pushed into the political wilderness by Roosevelt and his new deal, and their relative share of the national wealth declined significantly. During the 1970 their share of the nation's wealth began to rise again to levels not seen since the roaring 20's. Second there has been a concentration of ownership by takeovers and mergers which means that many areas of the economy are controlled by only a handful of giant companies. Two examples can be seen in the graphs below. 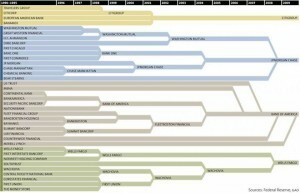 One shows that 37 separate US banks in 1996 were reduced to 4 in 2009. 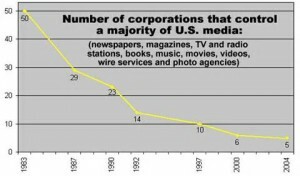 The other shows that 50 separate companies owning media in the US were reduced to 5 in 2004. In Australia there has been a similar concentration among the banks, and now the Australian media is dominated by Rupert Murdoch's News Limited. People are just beginning to realize that this concentration of economic power together with monopoly control over the media has allowed a very few people to gain complete control of the governments in Western countries. Large-scale globalization began in the 1820s. In the late 19th century and early 20th century, the connectivity of the world's economies and cultures grew very quickly. The term globalization is recent, only establishing its current meaning in the 1970s. The large-scale push for policies suitable for globalization was not necessary in the 19th century because at the time the West had direct control of most of the world as colonies. The cotton manufacturers in England did not have to ask the Indian government to allow its imports into India because India was an English colony. However after the destruction of direct colonial rule over the rest of the world the US and other Western countries had to deal with over 100 separate countries. 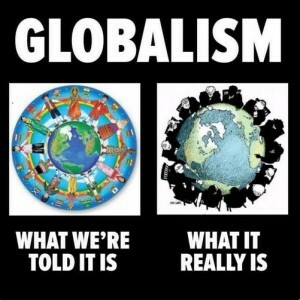 Derber explains what is the essence of globalization: taking political and economic control away from individual countries and handing it to giant multi-national corporations and banks so they can do whatever they want to maximize their profits. These corporations have as the statutory obligation to create the largest possible profits to distribute to their share-holders. They have no obligation to look after the lives, health, incomes, education of the people in any country. This is why those who oppose globalization see the political leaders who facilitate its policies as traitors. Their loyalty is to the profits of the overseas share-holders, not the people of their own countries. Refugees have been big news both in Europe and Australia. This is a very complex problem, however few if any of the self-appointed refugee advocates protest the many US organized wars in countries like Afghanistan, Iraq or Syria which has caused the largest refugee crisis since WW II. Many people also do not realize that the refugees in the EU have become pawns in the hands of those who push the globalization agenda. Paul Craig Roberts is an economist and commentator who was Assistant Secretary of the Treasury for Ronald Reagan and editor of the Wall Street Journal. He has impeccable conservative credentials as a Washington insider, not a “radical” in his basic beliefs. However he is a vocal critic of globalization and his comments on refugees need to be carefully examined. Recently billionaire financier George Soros has said the European Union should take at least a million refugees every year to ease the mass exodus of desperate people from the Middle East and Africa. Soros wants the EU to pay an annual amount of "at least €5,000 per refugee, or €20 billion." at a time of severe austerity measures pushed onto the European people. Paul Craig Roberts and many others see globalist policy behind this suggestion. Soros is a well-known supporter of globalization. To Roberts this means the individual countries of the EU are being forced to give up their traditional national identity. Refugee advocates see this as “racism”. However they fail to realize that the people who push globalization want to undermine the political power of every sovereign country. The counties of Europe are some of the most cohesive and oldest sovereign states in the world. They trace their history back 100s of years and have a common customs, language, literature and religious history. This in turn means they are unified in being German, French, etc. Such unity and solidarity will be an obstacle to the globalists plans to overturn their laws and living standards of the people in these countries. The support given to Donald Trump has its roots in the way that both political parties (and the Greens) have totally supported the globalist agenda in the US itself. The same can be said for Le Pen in France and the support for Brexit in the UK. We need to ask: Is Soros’ advice regarding Europe absorbing millions of refugees based on something different from humanitarian considerations? The officially unpopular Hungarian Prime Minister Viktor Orban says philanthropists like Soros must assume part of the blame for the current crisis. Three recent events have been deliberately distorted by both academics and the mass media because they are in essence a reaction against different features of globalization: the election of Donald Trump in the US, Brexit and the French election. Donald Trump and Marie LePen, the French candidate for president, are both widely seen as “fascists” and “racists”. However their real sin in the eyes of the 1% who control the universities and the media is that they are opposed to globalization. They want to change some of the policies needed by the super-rich to implement their plans for the whole world. Perhaps it is possible to summarize the previous discussion of globalization like this: The central feature of globalization is control of the laws, politics and economy of all countries in order to maximize profits for multi-national corporations and banks. Any law, regulation, political movement or economic plan which diminishes the profits of these foreign corporations must be removed. So what are the alternatives to Globalization? They are countless! Any country can develop an alternative to globalization by working to plan and organize their economic system with the aim of improving the jobs and living standards of their own citizens rather than maximizing profits for foreign investors. Many of the opponents of globalization believe the place to start is by nationalizing all banks. Apparently William Paterson, founder of the Bank of England in 1694 (then a privately owned bank) said "Let me issue and control a nation's money and I care not who writes the laws." This is why Russia and China want to develop a different financial system independent of the US$. Everything the US does around the world is aimed at stopping this new financial system. It would mean the end of US power and the end of US inspired globalization. 1. Apart from being a complex process, our understanding of globalization is made more difficult because many of the terms used in political discussion today are linked to it: 'neo-conservative', 'neo-liberal', 'the new world order', 'free markets', 'trade liberalization', and 'de-regulation'. Meanwhile its opponents have another name for it: imperialism. 4. The WikiLeaks Files (TWF), London, Verso Books, 2015, p. 50. 5. The WikiLeaks Files (TWF), London, Verso Books, 2015, pp. 42-43. Michael Bloomberg: American founder, owner and CEO of Bloomberg LP (net worth: $40 billion) Oxfam’s calculations are based on global wealth distribution data provided by the Credit Suisse Global Wealth Data book 2016. 8. Derber, Charles (2002). People Before Profit. New York: Picador.